On Monday I gave up running for the summer. I'd not done any for over a week and this culminated in me being unable to walk upstairs at work without getting out of breath. 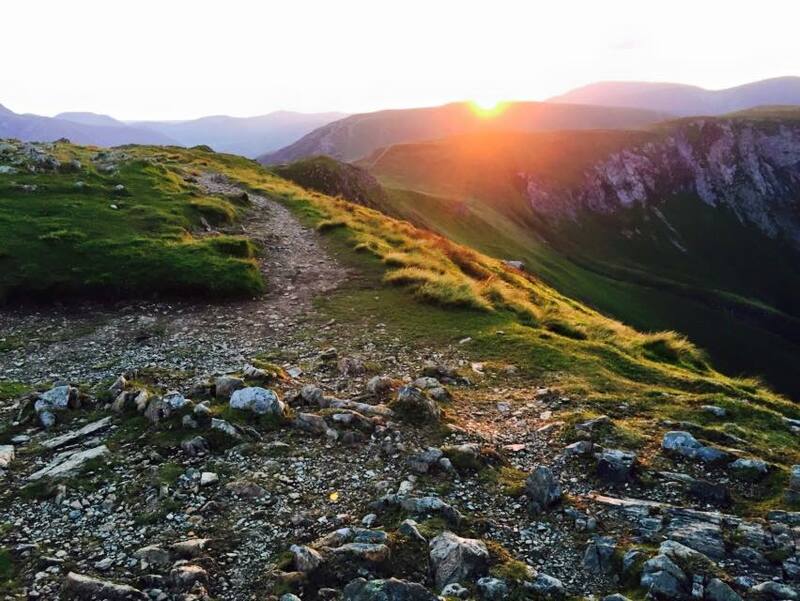 Summer has arrived and with it crushed all my thoughts that THIS year, maybe I'd sorted the vocal cord dysfunction and would never have to deal with not knowing day to day whether running up Helvellyn would be a breeze or whether walking upstairs would feel like summiting Everest! On top of this, a student in the classroom next to me demonstrated just what can happen when vocal cords close completely, which put me off trying that. I just didn't have the energy to go out and deal with the consequences when I couldn't breathe anymore and I couldn't always tell when that would be. I handled this in bad style and decided there was only one thing for it, I was staying inside this year. That lasted all of 2 days. Some medications to try and tackle the pollen plus speech therapy got things a bit more under control and the sun was so nice I couldn't not. 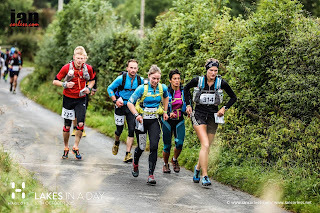 I knew it would feel hard, I'd be slow, my legs would be lead and require dragging up the hills and my respiratory muscles might just give up working enough to run (and sometimes walk), but I was sticking to my original plan to see what the lakes sky ultra had in store! It's going to be awesome! 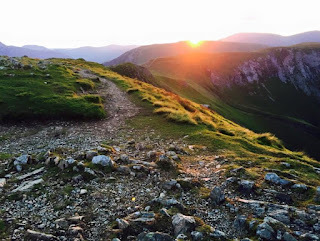 I didn't even get round to running off the back of nethermost pike, but heading up to Helvellyn, over catsycam, off the back and coming full circle via striding edge was a whole lot of fun! 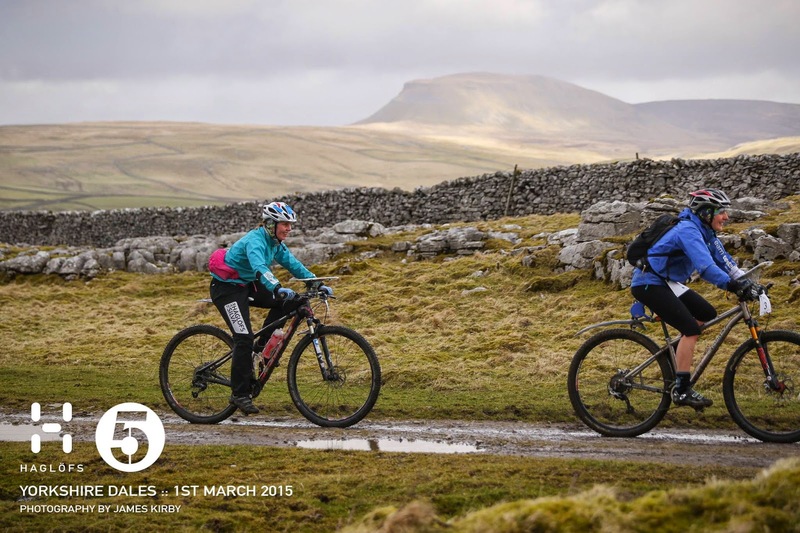 Tussocks, rocks and steep climbs and descents, my favourite! I didn't know there was a dam behind catsycam either. Need to get ankle strengthening to be confident on the ridges and remember not to gun it off at the start, there's certainly a lot of climb in this route! Don't fight with rocks, they'll win! So, I guess the moral of the story is I need to remember not to give up, I've had to go through this at least 5 times now and yes I ran slowly, yes I walked where normally I'd run, yes I had to stop and look at the view while my respiratory muscles recovered enough to tackle the climb off striding edge (which was a lovely hazy day in the lakes!) but hopefully in a few weeks I'll have got used to this summer malarky and be back to flying form! Bring on Jura and no 5hr30 breathing disaster this time! 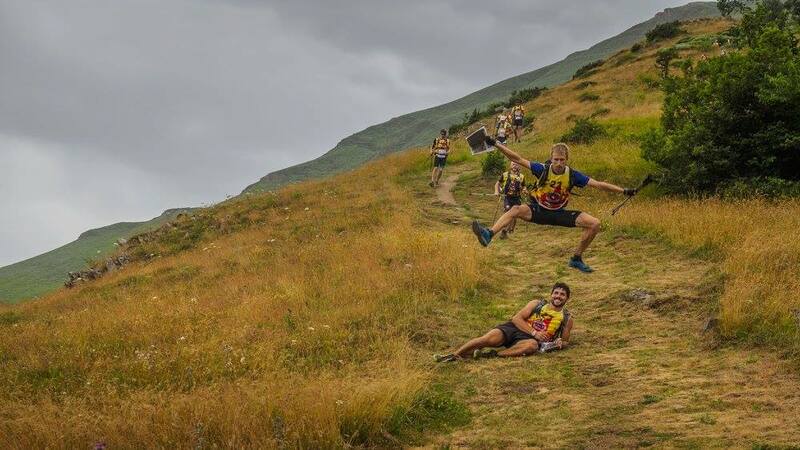 Ask anyone what I'm good at when it comes to running and they'll probably say 'long, rough terrain, rocky races with a huge amount of climb', or something along those lines. So it was a bit of an odd decision for me to decide I wanted to run a fast trail race, even if it is 32miles long. I'd done the Haworth hobble (32miles, 4400ft ascent) in 2011 and decided to see how fast I could run that. My previous attempt was 5hr 36, so I set myself an ambitious target of 5hrs (last time I'd prepared really well with the HPM and an open 5 the previous weekend and a wedding the afternoon/evening before). The route runs along the trails from Haworth, past Walshaw dean, widdop and hurstwood reservoirs, out to the long causeway where the wind turbines act as a marker that you're almost at the road. From here its an undulating descent into Todmorden and straight out the other side, up to Mankinholes and Stoodley Pike, before losing all the height again to Hebden Bridge down a very steep bit of tarmac. Out of Hebden Bridge, they clearly don't think there's enough climb in this route, as you head up to Heptonstall before dropping back into the valley to climb back up (up up for 3.5miles) and back over to Haworth. When I planned this in November I was already running 12-15miles at pace comfortably and planned to increase this up to the 30 mark over the coming 3months. This didn't entirely go to plan, firstly the students I teach gave me a stomach bug which took out a week or so's training, then I got the lurgy from them again at Christmas. This time it took me out for for around 4weeks....so in the middle of January I jumped back into running without the nice build up, full recce of the route, leg 2 of the BG and the Keswick 3 peaks all within a week got me some miles in. Not too surprisingly I didn't feel as 'floaty' anymore. Wadsworth trog served as a good marker as to how things were going at the start of Feb. Run over a similar area but with more bog and hills, it didn't go too badly but I certainly wasn't running as fast as I had been before Xmas and I had a few doubts about my fitness for more than 20 miles. Not much to do about it now other than a few more miles and a bit more speed work in the 4 weeks to the race. Photo - Woodentops. Having a chat to Adam as he passed. 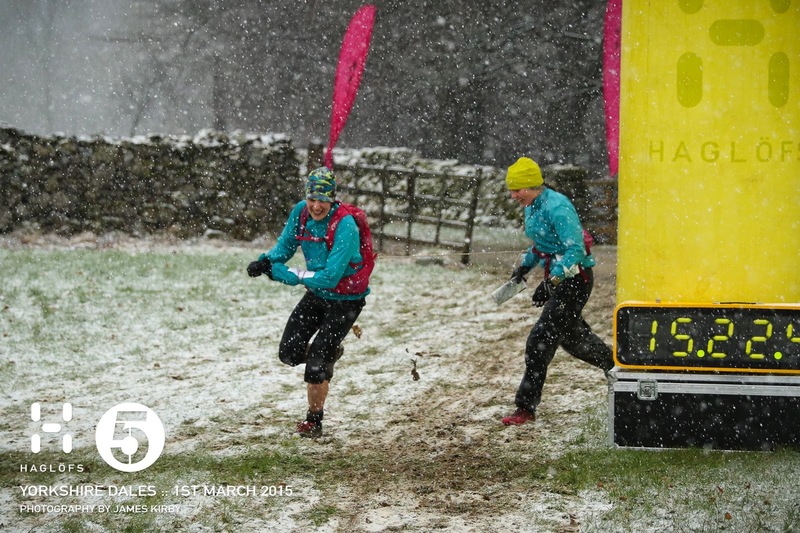 This year, Haworth Hobble also served as the selection race for the GB team for the world ultra trail championships, so the field was a bit more packed than normal. My plan was to see just how close I could get to those at the front, so as we set off I decided to go with them and see what pace they hit. 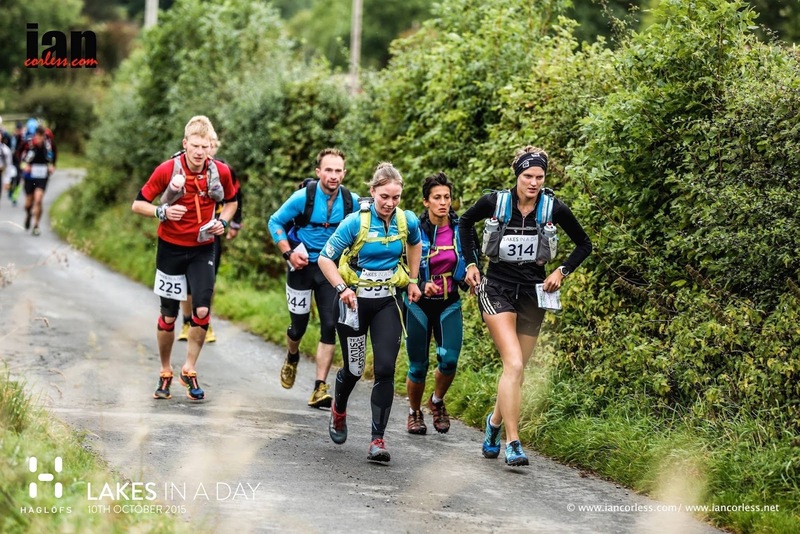 It was fast but not impossible....then I noticed the women's field had started to overtake Rob and Andrew Jebb, at which point I decided to be more sensible, there was no way on earth I was finishing ahead of them so why start there. So I settled into 5th and then 6th position around the 1.5mile mark as we headed for the trails. What I remembered as a fast dry course certainly wasn't today, it was a bit soggy and quickly christened my new shoes. The trails at the start quickly turn a little bit rocky and technical which suits me well. I don't seem to slow down on the slippy rockier paths (my friend Anna even suggested I get faster, but I'm not sure about this...) so this played to my advantage as we headed up and over to the first res. I provided some entertainment on the descent as I got a corner slightly wrong on the wet flag stones and careered off into a ditch to avoid hitting the deck. Out the other side of the res and the pattern for the day started to emerge, on the road I was clearly running slightly slower than those around me but on the trails, slightly faster. Thus started some back and forth with Samantha Amand, who had caught me as we hit the trails, I'd pulled away from on the flags and now she came steaming past on the road! Heading for the wind turbines and the trail flattened out, I was pleased to see I was keeping a good pace, through the 14miles mark in under 2hrs (probably a new PB for 2hrs there) and soon I was heading for Todmorden. 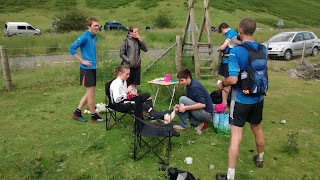 For some reason the trail across and down to Todmorden is not my favourite but I soon popped out the bottom, in the right place for the first time ever thanks to the guys I was running with and I was on to my favourite bit of the race. Probably the only part of the race that's truly fell running (as I've run it plenty of times before in noonstone fell race), I really enjoyed the climb to Mankinholes and Stoodley Pike, eating as I headed for the summit and conserving some energy for the climb to Heptonstall that was still to come. Running down to Hebden Bridge I saw Bashir running up the road and must have still been running alright as he commented on my relaxed gait. 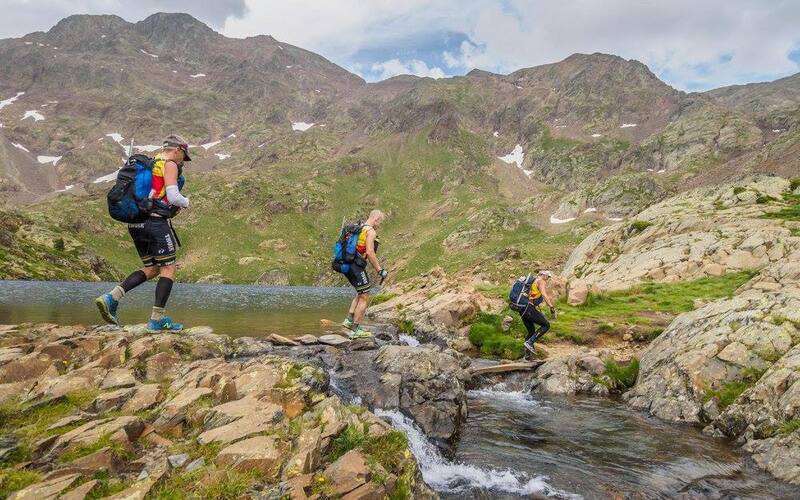 Unfortunately the race from here on in requires you to be an actual runnner, not reliant on slippy rocks and fell running to get you by. As we hit Hebden Bridge, Sabs caught me and ran past, along with two other ladies (Samantha passing by again I think). There wasn't a lot I could do other than run harder than I might have chosen to up to Heptonstall and we hit the bridge in the bottom of the valley together as I knew where we were going ;-). Then came the 3.5miles of uphill runnable trail. My worries about the bit after 20miles started to be real, what was I doing trying to run these last 8miles? We were on Sab's terrain now and I just tried not to be gapped too much. As we hit the road part of the climb I picked up (this is steeper) and I suspect all of the damage was done by this point as I managed to get my legs to turn over better heading over the moor and up the road to finish off the climbing. I'd entertained the thought that sub 5hrs was on around Stoodley Pike, but it snook over to 5hrs 9mins by the end and I finished 10th lady. I'm pleased with this as I'm not surprised my ability to keep a fast pace going on smooth trails faultered towards the end (as I said at the beginnning, nobody would say this is my forte even before I've run 25miles). I certainly set new PBs for distance run in 2hrs and 3hrs (and probably 4 and 5hrs too). Sabs asked at the end whether I wondered what would have happened if I'd set off slower with her. Looking at the GPS traces, the answer is no. I was never more than 4mins ahead and this was mainly thanks to the slippy flagstones in the first 5miles. 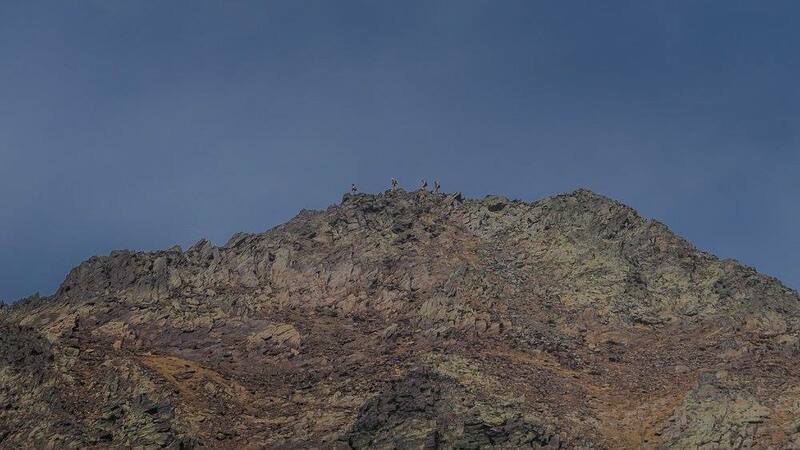 From there on, any fell type terrain I tended to run slightly faster and any smooth trail Sabs ran slightly faster until there was enough smooth trail to reverse our positions. I suspect setting off slower would have meant a slower finish outside the top 10 as I would have relied on my abilities (or lack of) to run on smooth trail at the end, rather than my abilities to run over wet rocks. One thing I'm particularly happy about is that I finally dug deep and raced hard, not backing off when things started to hurt. This is something I haven't found myself doing for some time (even with some good results in the last couple of years). Hopefully this will set me up nicely for some long fell races this year with my race head well and truly on. Don't fear, me and Rosemary still raced the open 5's and even with these being my main exercise for the month, managed to find some form towards the end of the series, wrapping up our 4th series win (PlanetByde did not skimp on blogs and documented the lot!). 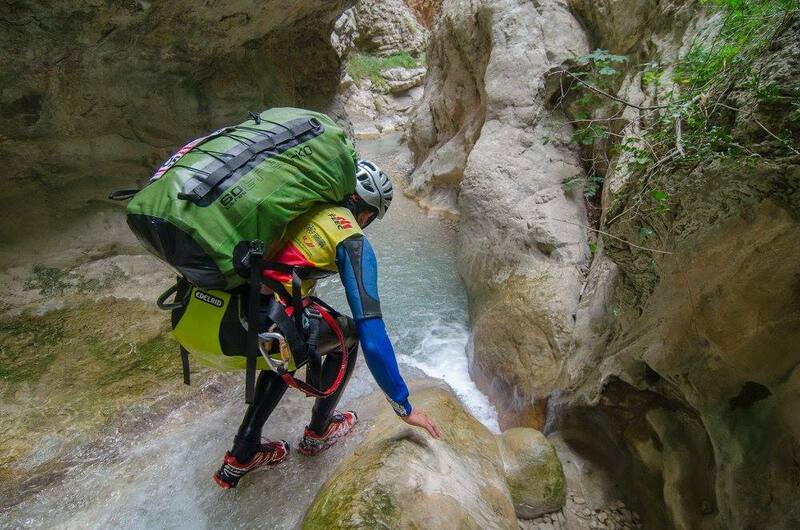 Generally this year has been a bit stop and start, no consistant running/biking or paddling but plenty of fun. 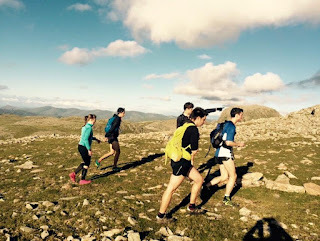 As the lakeland classics started I decided these would be a good set of races to get me fit, even if I did have to ignore some of the times I was going to run. Starting with Duddon, things didn't go so badly for about 13 miles! Shame it's 18 miles long, the heat killed me off from Dow and I lost a whole chunk of time! At the end we went to the pub and I got persuaded to give up on doing all of the lakeland classics in favour of a British Champs fell race in Wales the following weekend. Ras Pedol Cym Penant was a bit of a boost, even not running anywhere near my fastest, my climbing legs were coming back (still regaining strength from the BG!) and the rough terrain allowed me a 15th place which was nice for a champs race considering this was my second long run of the year. Onto week 3 and I got tempted by the Great Lakes race. Now I was gaining a bit of fitness. 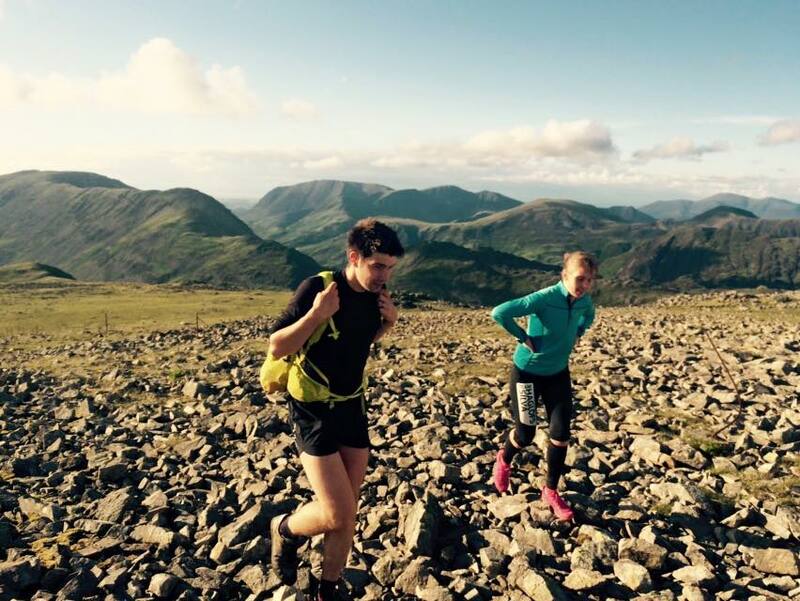 I felt strong up Bowfell, tailing the eventual winning lady. I love the Scafell ridge when it is dry and had a brilliant time rock hopping my way along. Again, a brilliant race for around 8-10miles...then a massive stagger back to pike o blisco, but somehow holding onto 2nd (I don't think anyone loves that final slog). 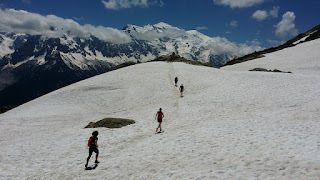 By this time I was fit enough for my holiday in Chamonix :-). 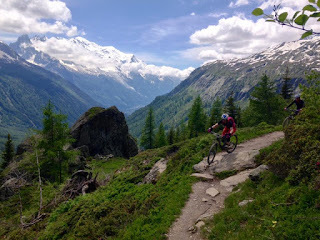 A brilliant week in a luxary chalet (at heavily discounted summer off season prices), biking and running on amazing trails. I was ready to move there for good! At this point I recieved a message from Team Dutch Adventure. They were looking for a girl to race with them in the AR European Championships which were being held in Vielha in the Spannish Pyranees. Well, what more could they say to persuade me, more biking and running in big mountains, yes please! I was now finding the perks of being a teacher ;-). It turns out, if you are in Vielha and needing a bike part, go to France. It took a day to work this out which was getting close to race time, but eventually, thanks to Team Ellis Bringham and friends, I made it to Luchon in France where the cable was fixed....and me and Bill ate ice cream :-). Preparation complete! 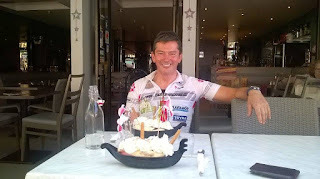 Banana Split in Luchon to celebrate two working breaks! I didn't pay too much attention to the route planning, this was Wodi, Wout and Patrick's race and my aim was to play the role of keeping up. I made a mental note of the first few stages so I knew roughly what was coming though. Off the start line, as is always the case, the pace was faster than anyone will keep going, after a blast on foot round the town we spun round the first MTB stage, a token 1hr45 loop back to Vielha. Back into transition and it was like I'd never been away, wheels off, bike in box, camelback in bag, food packed, poles, ready and GO! I'd been promised that if I slouched in transition I'd have Wodi hovering and pushing to leave. My memories of my transitioning skills are pretty poor, when my breathing was particularly bad in the Itera I remember sitting on the floor unable to concentrate and getting the guys to name items for me to put in my bag, so I really did have a bad impression of my abilities to be fast. Turns out it is all relative and with a clear head I am actually well practiced :-). That was a nice surprise and set the scene for the fairly frequent transitions over the next 24hrs, where I was on water filling and bag/box moving duties. Now the race actually started, although this was more of a taster, a trek up, up, up to some stunning views. The pace was hot up the hill (and this is my best discipline, I'm not too shabby on foot), but as I said, this was not my race so I dug in (on tow) as we raced past teams up the steap 1300m ascent. What can I say, this is the approach I was used to with Haglofs Silva as this is where we gained most time so I went with it. 3.5hrs into the race, we hit a col and the tow came off. I was in my element, lovely trails followed by a techy descent off the beaten track. We hit the town for a short individual orienteering section and rolled into transition in around 5-7th place (which pleased the guys, their aim was to finish in the top 5). Next up, back onto the bikes for another 1400m ascent. There was a change in the team dynamic at this point. 6hrs in and I was not the one on tow.....Wout was struggling a bit so Patrick got him on tow and the four of us moved on up the hill. We were still covering ground well, maybe dropping the pace slightly on the final steap ascent to the ski station where our control was waiting, but in the mix with lots of teams going back and forth. It's amazing the difference 1400m can make, at the bottom, so so hot, at the top wet and windy, making it cold enough that I almost hit the point of stopping to put a jacket on! As noone else did I (wo)manned up and carried on hoping we dropped height to warmth quickly. Of course we did, this is the pyranees :-). Early evening and we were inflating kayaks for a short paddle to a ropes and canyoning section. There was a small queue at the ropes course (timed out) and I kicked myself for not putting in a tin of food to eat during this time. Then again, until we got there it wasn't clear what could be left where or how much waiting time we would have, and I didn't want to carry a tin up a hill. Abseiling into the night, we then paddled our way back to transition for around midnight. Time for some hot food as this was the only place in the race hot water was available. At this point, the race turned into the part of an XPD that will make or break teams. Next up, 55km of mountain biking with 1200m and 1400m back to back climbs. 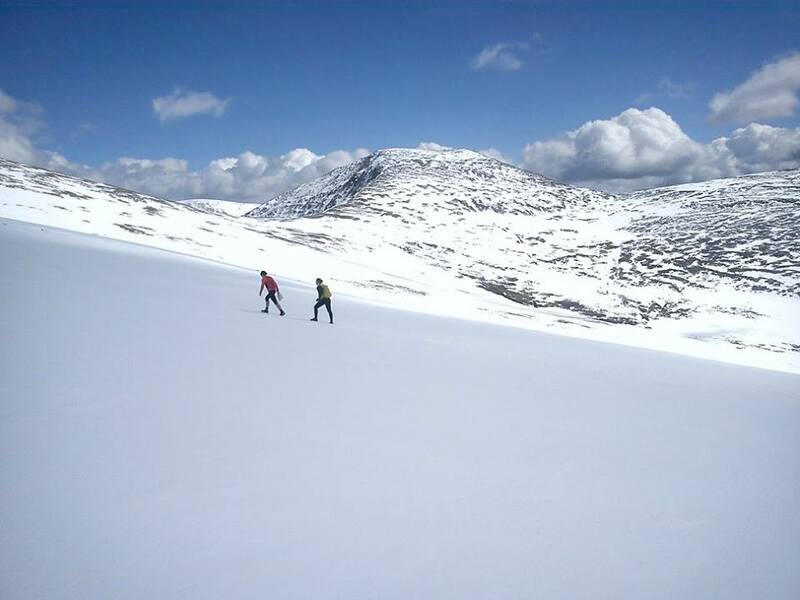 After that, the 'High Mountains' section, 25km trekking with 2700m of ascent, potentially requiring ice axe and crampons. Third up, 115km 'mountain bike marathon'. We set off up the first ascent on the bikes, lights on! Around an hour in and unusually I was finding it hard to stay awake. Usually the first night is ok, but clearly the altitude was having a bit of an effect on that (the last time I suffered the first night was when racing in Canada up high). I felt slow but must have been making progress as Wout was having a hard time behind somewhere. Another few switchbacks and it was called. Wout needed rest so we found a lovely bit of forest to stop in. He said 15-20minutes should do (I was happy with anything from 10mins onwards), but Wodi suggested as we were stopping and having to put clothes on, we stop for an hour. This is a first for me! It was amazing, an hour later, freezing to the bone I might add, we set off again and once warm, I was right back on it. We weren't far from the summit, then there was an 800m descent. Unfortunately it was not intended for bikes, so the majority of it was hike a bike. We emerged at the bottom in daylight and I was ready for the next 1400m of ascent! I was in the racing flow now, my brain and body had remembererd what an XPD was, I knew exactly what gradient to walk jog the bike up to avoid SI pain and stuck the chiru in the lowest gear, twiddling my way up the rest. After a few switch backs I looked back and realised there was a problem. I was taking out a lot of time on the guys. So, here's the problem to solve. I feel brilliant! I don't have a bike tow (there was some certainty I wouldn't need it so it was in my bike box which we wouldn't see for another 2 sections - my plan was to take one off somebody else on the offchance I needed one). I can't carry extra weight on my back as my SI joint will go wrong. I suggest I take Wout's tow on my bike. Then we hit a problem. The team have gaffa tape as an emergency strapping solution instead of zip ties. That is not going to hold it. I suggest swapping bikes. We measure up and it doesn't look promising that my saddle will go high enough for Wout (or his low enough for me). 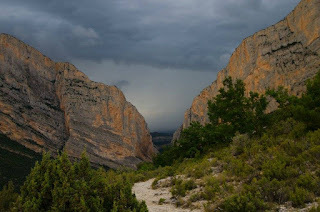 The High Mountains - Aparently a rope might have been nice. So that's the end of that one. All that is left is to steadily progress up, up, up....again. Another 10 switch backs and Patrick is really concerned about Wout's progress. I asked when he last ate, it doesn't sound like recently. Time to open the top pocket of my bag where I keep my 'emergency supplies'. Out comes a gel and the shot blocks (I didn't think we'd need these until day 3 or 4). I hand one after the other to Wout as he passes and dig out some crisps and a bar to follow up. I don't tend to hand out my race food that often as I can't just eat anything my team mates have in their bags (unless they all agree to race gluten free.....anyone? No? You mean you don't want the super expensive option?). Have you ever tried to work out if a food contains gluten after 2 days of racing? It's not very efficient or accurate. This gives Wout a small boost to get us to the top, then, you guessed it, its down for a very long way. This time its rideable (mostly) and good fun. 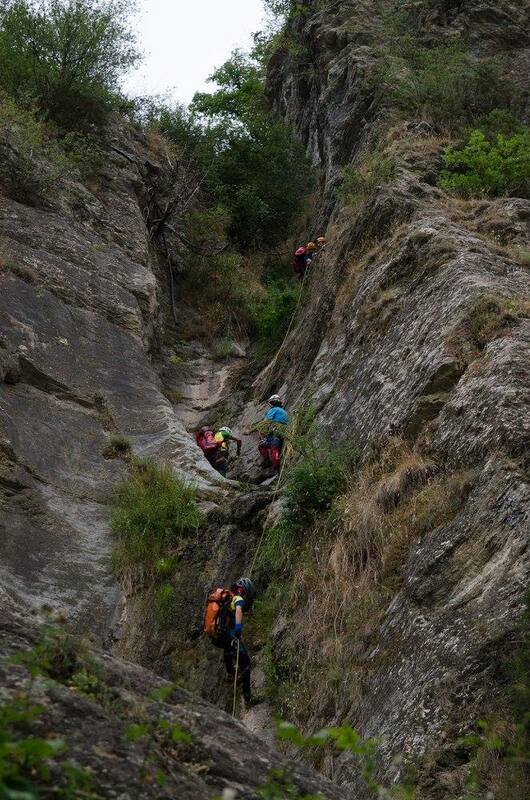 I'm glad I've been practicing my steep switchbacks in Chamonix, it makes it a good, challenging, fun descent. Unfortunately, whilst I am having a brilliant time, Wout and Patrick are not. We arrive at the bottom and both need to eat and rest before contemplating the next stage. 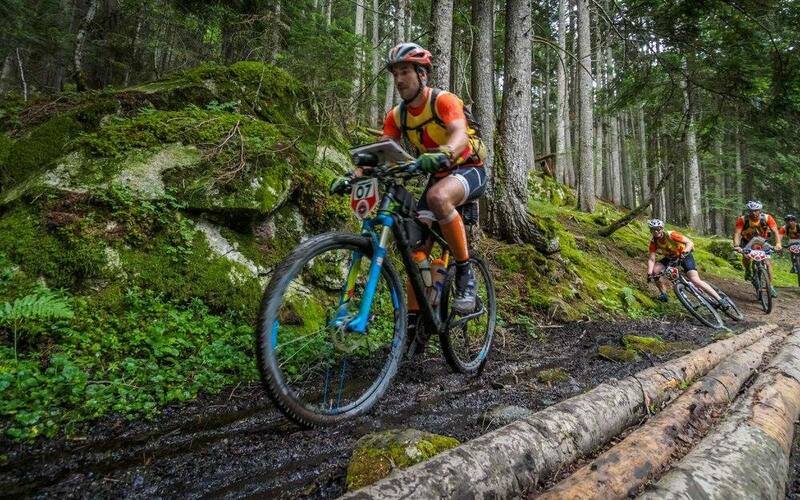 After half an hour, the decision is made to miss the next trekking section and try and continue on the 115km mountain bike marathon. Darn, I was really looking forward to the high mountains, I don't really relish getting straight back on the saddle or putting my feet back in my bike shoes straight away....somehow, during transition, me and Wodi persuade the others the high trek is the better option. We're still well within cut off for it! The stage I was gutted to miss - High Mountains with scrambling ridges. ~6km in and that's it. Wout sits down, he can't carry on. Ellis Bringham come past and Barbara suggests we all need gelato at this stage (little does she know that is exactly what I plan to eat next ;-)). A few hours and some food including lovely local melon later, Thule arrive in transition in the lead. All is not well, Simone's freehub has broken, a local boy leant her his bike to do the short out and back ride to the trek hoping to fix it in the time they were away.....it's definitely not fixed. They ask where they can rent a bike, I don't think there is anywhere very close (read 50km+ downhill in the wrong direction?). Time for Wout to decide for sure if he is going to carry on. The ultimatum, if we are definitely not carrying on, then I'm giving my bike to Thule. Even with that prospect, the resounding answer is still no, so I 'rent' my bike to Simone and off they go, the Chiru on it's way to winning the European championships without me. 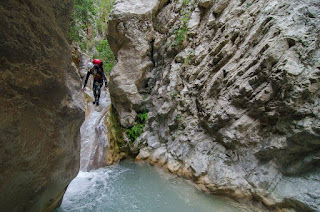 So, we spent the night at transition, I then rode Wout's bike down the short cut (65km) to the next transition in the morning with Wodi and Patrick and picked up the race route for some spectacular canyoning and trekking. It was awesome fun to be able to do this anyway and as we arrived at the end of the trekking section at 4pm, I figured that was a good day out and time to call it until tomorrow. Patrick didn't want to do any more so joined Wout as event staff. Wodi was super keen so carried on into the night (riding a slightly too big bike all night didn't appeal to me for some reason) and I stayed at transition. Here I met Emily and Klaus (Team 23), Emily kicking herself for having been to hospital, putting an end to the headline 'Team of random racers from all over the world who met 24hrs before the race come 3rd in European Champs' (from Klaus' description of their adventures, it was definitely the right call...). Emily has diabetes and I was impressed with her string of racing achievements. I know how hard it is to get food/glucose right with a working pancreas, I can't imagine XPD racing without! A few hours and a hail storm (in 30 degrees?) later, the rest of team 23 arrived having a wail of a time. These guys were out for a good time, the jokes just kept coming and I think herein lies the key to XPD success. Yes you need to be fit, prepared to suffer and push yourself hard. But a team that goes out to have fun and enjoy the race (whilst racing as hard as THEY can race) will always do well. The organisation transported us to the last transition at 2am where there was a bouldering wall!!! Yes! After a night on a hard floor with only my XPD kit to use, the bouldering mat was amazing. At around 7:30am I awoke to Thule arriving. A few hours of team watching and I had itchy feet. It's not normally the paddling sections I want to do that much, especially in an inflatable. But in the heat I was keen. So was Emily (Klaus had made it very clear the night before that his feelings for paddling rivalled Tim Higginbottom's and he would not be joining me or Emily). 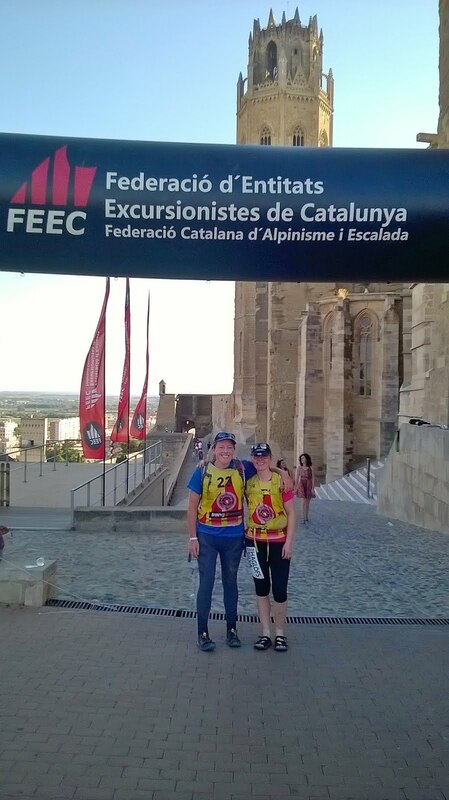 We set off and had a fun 6hrs of paddling, stand up paddle boarding and orienteering to finish at the castle in Lleida, a fine finishing location. It was sad not to be finishing with the team, but I had a great few days and made some friends I would never otherwise have met. I feel a trip to Switzerland, Canada and NZ are on the cards! On the plus side, two weeks on I've been out on the bikes and running, recceid half of Borrowdale, had an 8hr day out recceing Lakes in a Day with my dad and finally am feeling fit again. It's great training to not kill yourself in an XPD ;-). It's been almost two years in the making, but with no more silly researching hours, no more teacher ed and 4 days of work a week from the end of August, I think it's time for some proper racing fun again (with the unfortunate caveat of the school holidays, World Champs in Australia not looking too promising at the moment)....watch this space! In late September I figured my legs had probably had a good rest post BG, so tested them out at the Three Shires fell race. Slightly over optimistic on the recovery, it was harder work than it should have been but given a bit of effort I could run. It was a beautiful day and a bit of tooing and froing with Nicky and Wil along the way kept me running! After about 2hours my legs suddenly said 'no' though, so I backed off on the final climb, wanting to make it to the finish still running! First bit of fast running of the year - Ali reminded me how to race downhill at the IHMR! 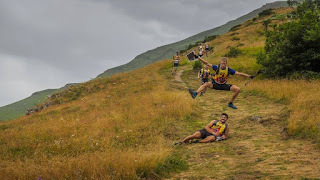 3 weeks and one Ian Hodgson Mountain Relay later my legs were feeling much better. 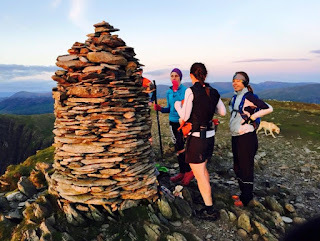 I was looking forward to the first half of the LIAD, knowing my pacing pretty well over Blencathra and the Dodds. 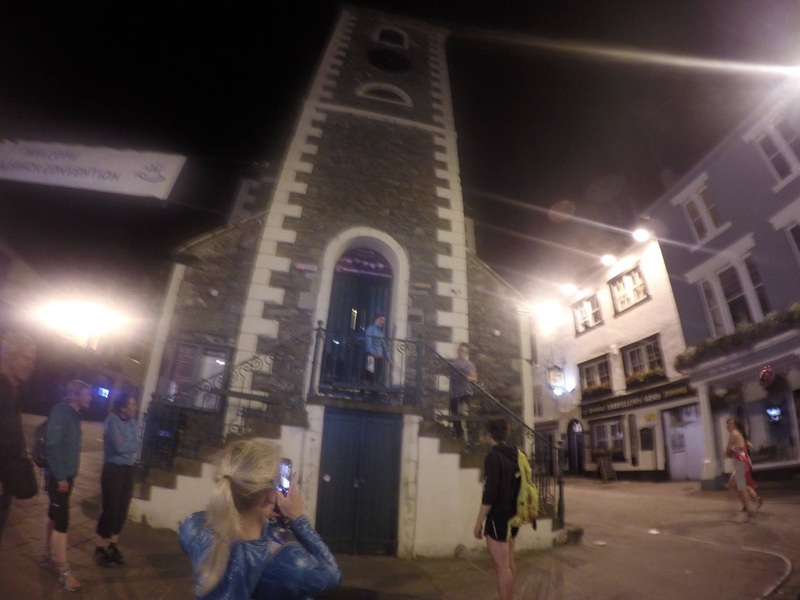 I estimated it was possible to get to Ambleside in around 6hrs 30, possibly slightly under if it all went very well! From there on in, the plan was to hang on as best I could as that was where you actually need to run, heading over Claife Heights, High Dam, and Bigland (I'm not as good at that bit when there's no awkward terrain underfoot or steep climbs to contend with). Some race faces already. We were chatting really though! Starting out with Helen and Sabs we had a quick catch up along the road. When we hit the fell Helen was off, but I was happy to let her run up the first hill, keeping her not too far ahead, as I knew where my strengths (and weaknesses) lay. Blencathra seemed easy, maybe due to the amount of chatting I was doing with Larry, a Pennine member living in Kendal, but it passed by easily now I was on my own terrain. Looking at my time, I was moving very similarly to my BG pace so this was good! Halls fell was a good bit of fun. Joe Faulkner said he was enjoying watching 'fell runners vs ultra runners' heading down the hill and I soon found out what he meant, making up a fair few places on the rocky decent. I hit the feed station around 2hrs 20 - 2hrs 25mins, within about 5-10minutes of Helen and up on my half thought through schedule. 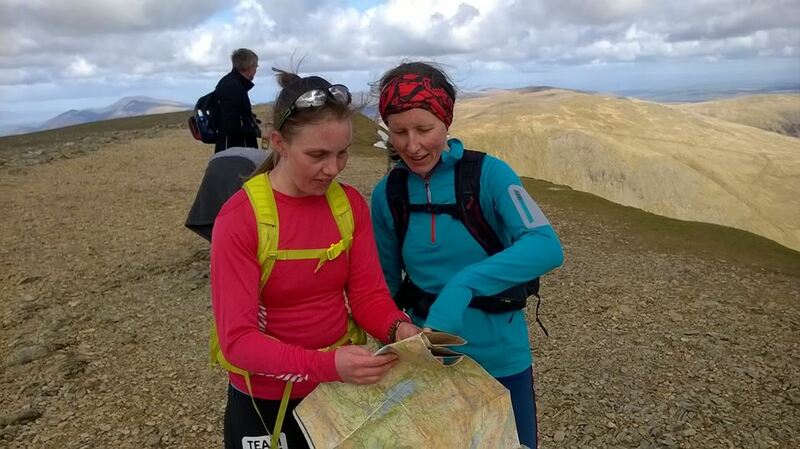 If my plan for Clough Head and the Dodds continued to go well, I would hopefully see Helen again soon :-). 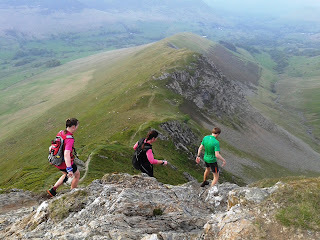 Halls Fell - good fun descending! So, there wasn't a lot else to do other than put one foot in front of the other, watch Sabs run off and enjoy the views. 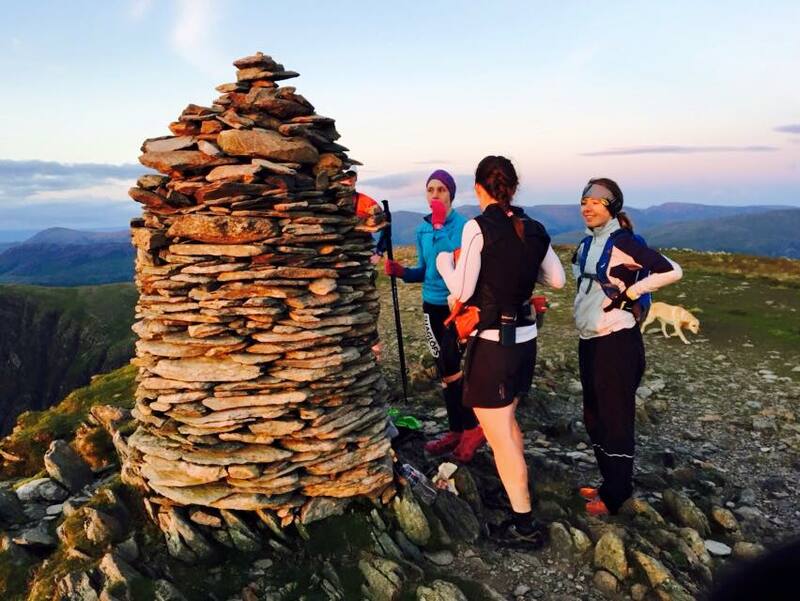 It made life a lot more pleasant as I wasn't going to fight to climb fast and I arrived in Ambleside after 7 hours, enjoying a lovely run on a stunning route! I ran over Claife Heights with 'John' and we had a good chat about some silly ultra runs he'd done. I seemed to be moving fastest whilst chatting in this race as I cleared claife heights, the part of the race I thought I'd slow down on, much faster than anticipated and faster than a lot of the men did last year according to strava. Perhaps a little too much left in the legs? 'Mike' and his support cheerleaders were a welcome sight along the way and we too had a bit of chat over to high dam. Ultra's are great for my chatting style of running ;-). Maybe I measured the effort just right as running the last few miles to Cartmel that 'no' sensation was definitely imminant. But I ran over the finish line in 11hrs 59 to finish 3rd, around an hour and forty minutes faster than the previous record, but an hour behind Helen's fantastic run this year! A great route for an ultra and another well thought out and supported event from Open Adventure - thanks for the GF pasta at Ambleside Sarah! 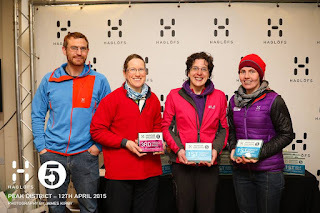 Just enough time for a shower and a bite to eat then it was off to the BG dinner, sporting my shiney new Haglofs LIAD finishers t-shirt, to recieve my certificate and dance the night away! I'm not sure how, but my legs recovered well enough to do the FRA relays justice a week later (I think BG dinners are clearly good for recovery). 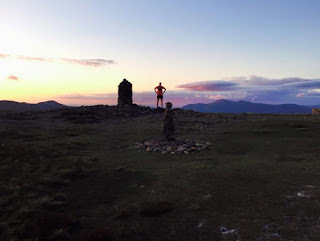 I knew one day I would do the Bob Graham, but there was always another race or target for the year that would make doing it outside of mid winter pretty difficult. Last November I hit a new high in my running/biking/general ability to keep going as long as you like as fast as you like and given I had no plans race wise for 2015 I started to think about doing it this year. By March, all of last years training and racing fitness had been undone. A tooth infection, a job requiring more hours than there were in the day and the reemergence of the breathing difficulties of the last few years left me absolutely exhausted, especially mentally exhausted. I got to April unfit, unable to race or interval train without having to stop due to breathing difficulty (this made club training and general racing a pretty unattractive prospect) and pretty unmotivated to do very much. Then I went part time. Within a couple of weeks I was much less shattered, 4 weeks of part time work/part time running and it was time for the old county tops with Steph Jones. 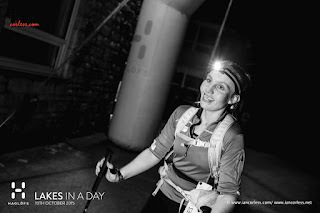 Although not moving a patch on how I had been last year, I was surprised to get round in under 9 hours, finishing second ladies team, with my legs generally unscathed and so the BG crept slowly back into my head. How to pick a schedule? When it came to doing the BG I wanted to see how fast I could do it. I was fairly confident, having done some fairly ridiculous races, that getting round in 24hrs would be fine. So then I had the conundrum of how far under 24hours to target. I'd always wondered if the 18:48 womens record would be doable 'one day', I thought it was but also thought I'd wait until I was 'a bit older' to give it a go. Obviously in the last 3 years Nicky has made this more challenging and the question of whether to try for 18 hours was a hard one. My major concern was that I knew how hard it would feel at some point on the round and for the first time ever was worried that, given my mentally exhausted state, my head would be the thing to crack first. If I wasn't prepared to suffer, there was no point in starting on an 18 hour schedule! 'How to run Leg 5 fast' by Rich T.
A couple of months of supporting faster rounds, running to pace on sections and seeing how it felt and it was just too close to call. So I decided to throw caution to the wind and go for it! Above all else, I knew how little I wanted to run the BG, no matter what pace, in horrendous conditions. I made it clear I just wasn't starting if the forecast wasn't good. 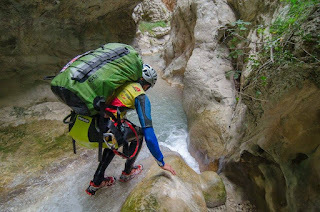 The week leading up to my attempt was not ideal, a little wet but mainly too windy. The week after was forecast for horrendous downpours. But the weather gods were smiling on me and the 25th of July could not have been better. Not too hot, not too cold, not too windy, not at all wet! 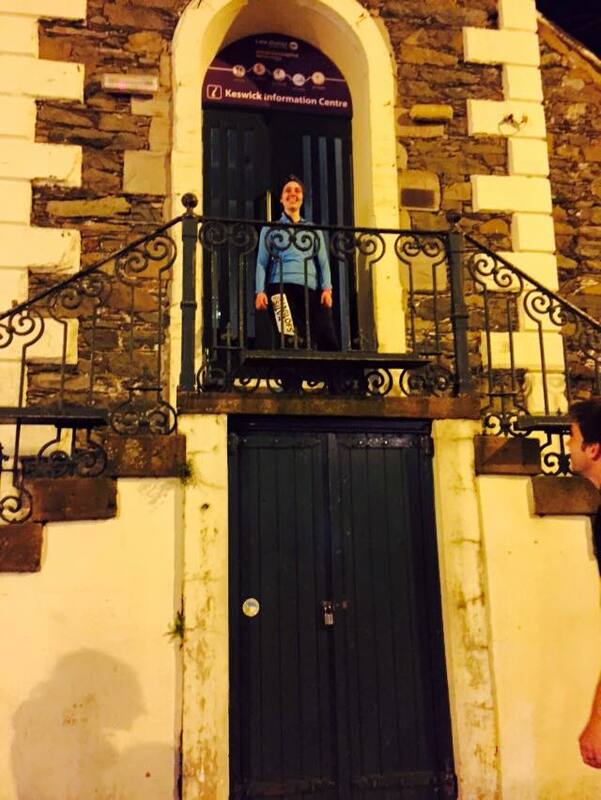 At 3 am I set off with Tim Austin and Jonny Malley as support for leg 1. Heading up skiddaw we made good time and were rewarded with some spectacular views. 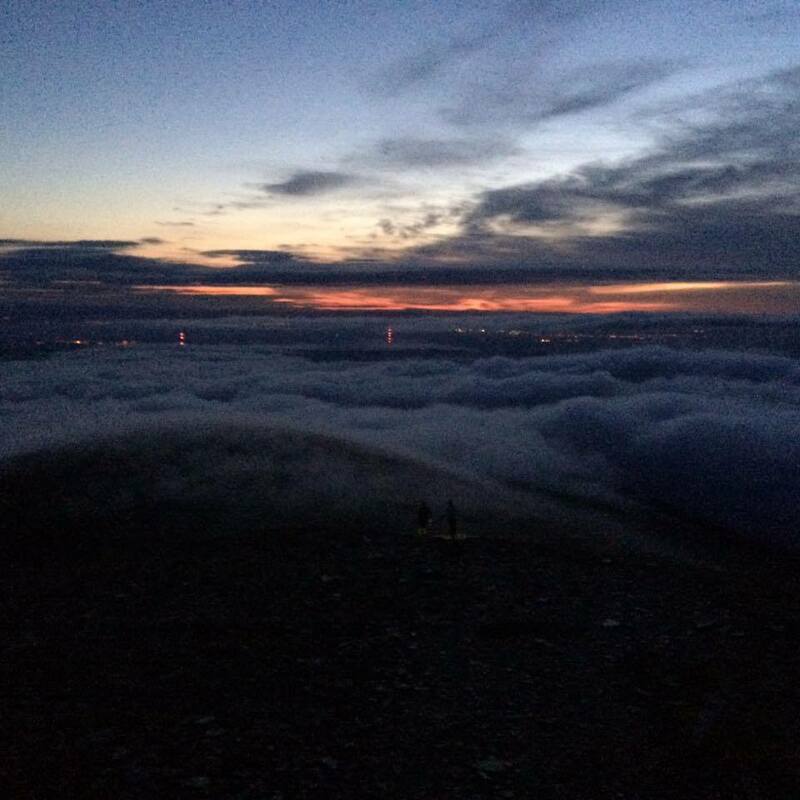 The lakeland 100 was descending to Braithwaite and the train of headtorches snaking its way across towards Skiddaw was an amazing sight. As we hit the steeper part of the ascent we met Angus descending and looking a little dazed (I suppose he's allowed to after 10hrs of running) as he and a fellow 100 runner were undoing a slight detour from the route....we summited as the sun was coming up, greeted by an amazing cloud inversion. It's amazing how much the BG route gets trodded up as the lines across great calva and to Blencathra were much clearer (although also much wetter) than when I'd been out in May. Here I perhaps made my first mistake, I tried to drink a 'for goodness shakes' en route to Blencathra and this sat heavy in my stomach. However, some fantastic nav and feeding from the guys (just before Blencathra: Tim: 'do you need any food', me: 'no, I'm ok', Tim:'wrong answer, here's some chocolate raisins') and we topped out on Blencathra at 5:41, 7 minutes up on schedule. This worried me slightly but I resolved it was ok as my legs and body in general had felt well within themselves. I would just sit down in Threlkeld and change socks/eat as a reward. Heading down the parachute descent was fantastic, I do like this descent and hit it pretty much spot on to avoid the worst of the rough stuff (although Jonny took his own line and had a sprint finish down the road to catch us! Proves it makes all the difference to take the right line...). Leg 1 complete in 3:06. Setting off ~5 mins up on schedule with Sabs and Dave, we crossed the lakeland 100 again, happening upon a couple of dragons back attendees. A quick catch up for Sabs and Dave and we headed away from the 100 course once more (with a few shouts of 'it's not that way' following us). 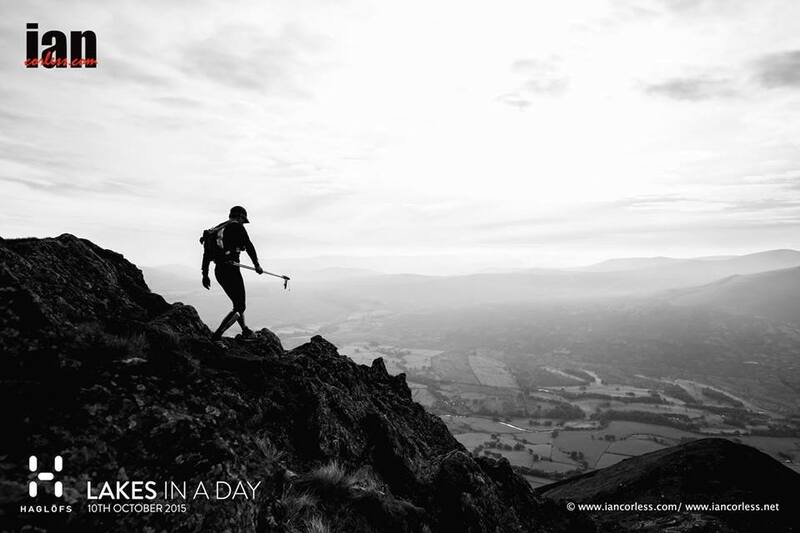 Wil had said that on his round, it was on clough head that he knew he would be able to make it. I thought this sounded a bit early on but as we climbed to the summit I knew what he meant. I felt great, legs still strong and climbing the fastest I've ever managed clough head (I'd built in extra time here as I particularly hated this climb previously). I took back the minutes I gained up clough head en route to great dodd to try and eat something more. The views across the dodds were fantastic, although I made sure to avoid looking too hard at what was coming next. I thought it would be on leg 2 that I started to feel the pace in my legs, my plan being that if I did, I would assume the game was up and drop the pace to make sure I got round. Helvellyn came and went, as did fairfield and there was no sign of the distance or height covered affecting my legs. This was better than I'd hoped. Plummiting off seat sandall I arrived at Dunmail still 5 mins up on schedule, leg 2 complete in 3hrs 39. I used the minutes wisely, again eating and changing shoes, swapping my haglofs pulse long sleeve for a short sleeve as the day was heating up. 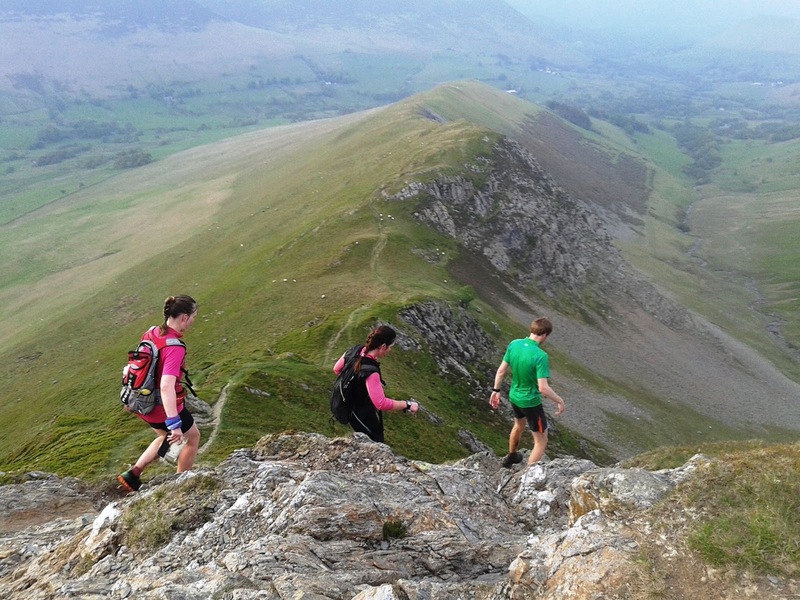 We set off on leg 3 marginally up on schedule, leaving dunmail at 9:54am. I know there is no such thing as leg 3a in the BG, but it's as much a mental game as a physical one and in my head, there were two sections to leg 3. 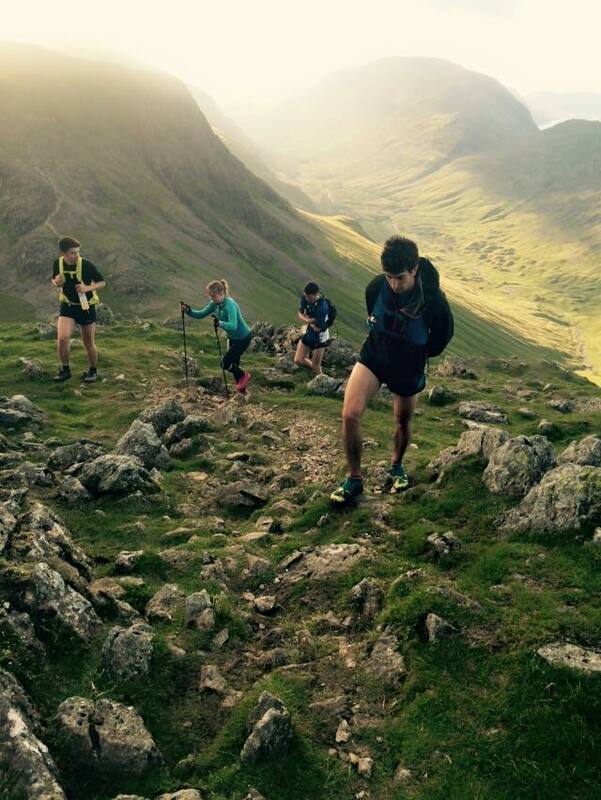 My favourite one was 3b as I really enjoy the rocky terrain, but first came the langdale pikes! I wasn't too interested in the exact timings across this section, I assumed at some point I would start dropping time and all I was interested in was running at a pace that still felt comfortable. Legs were still strong, it certainly didn't feel like I'd run 30+ miles and I was surprised to find that by Bowfell we were still, bang on schedule. 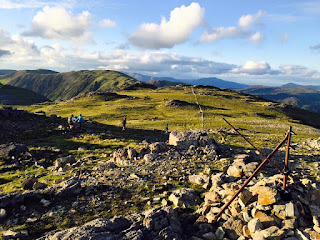 While everything felt ok leg wise, no real soreness or heaviness yet, the climb up bowfell had felt a bit more of an effort than it should have been, so we took a couple of minutes at the top to cram more food in. Unfortunately I took one bit of food too much on board and then there was none inside me. We headed on, I was desperately trying to get anything to go in, fully aware that whilst my stomach felt a lot better, my legs soon wouldn't if I didn't replace the lost calories! A chunk of time lost to esk pike and unbelievably I was just about still on track for record pace assuming I could keep moving well enough to take the odd minute back. Make or break time with getting the food in! As we headed for Great End the inevitable happened, it was as if a switch had been flicked, 'legs absoltely fine' to 'quads really quite sore'. I was running on empty and really had to get some more fuel in! Remarkably I didn't drop much time over to scafell, clearing broad stand, where my dad was stationed ready and waiting, without incident. But heading down to wasdale the effect of the lack of energy for my legs to draw on was aparent and another chunk of time was lost, landing me around 20mins down on schedule. With any thought of the record gone, my plan now was to refuel for leg 4. Hopefully a sub 20 could still be possible as we left 40 minutes behind schedule. On up yewbarrow with Neil, Helen and Wil and the ease my legs had still just about had to Scafell was all but gone (or it felt that way). The only way to get food down at this point was to stop for a picnic, which we duly did a few times en route over red pike, steeple and pillar. My moving pace was actually ok, but that ignores the many minutes of picnics I also had to have to keep me moving. 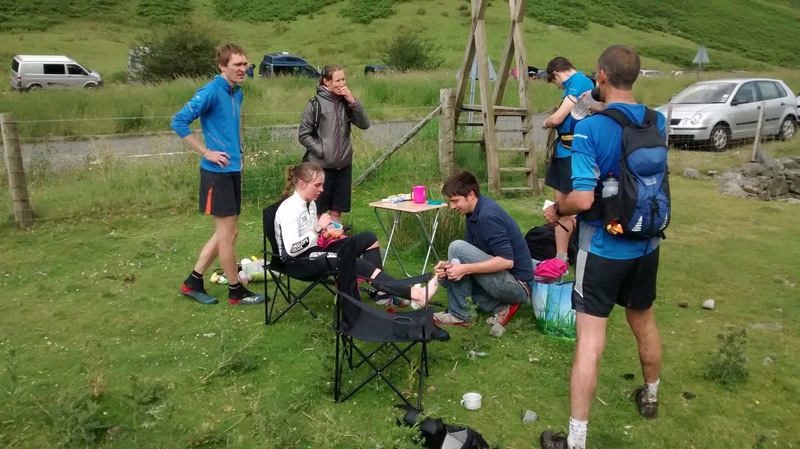 At least 50% of the time lost on leg 4 was due to having picnics. Passing through blacksail we picked up Tom, Rhys and Benn dog for additional motivation, including a gable story from Tom (which I'm sure I was meant to remember, he might have to tell it again ;-)). There were some lovely views but I barely had chance to take them in - I did sneak a glance at the view of the whole BG, it is amazing to be able to see it all laid out! In general, it was a fine balance between pressing on and getting food in but eventually, after 5hrs and 5 minutes we reached honister. I'd lost a further 1hr 14 minutes to the schedule so was now looking at around 20hr 30 if I was lucky. Come on, what's taking so long? I wasn't lucky. 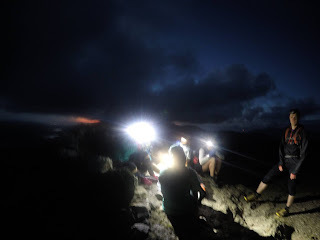 There's not a lot to be said about leg 5 other than it is possibly the worst I've ever felt (although this might just be because I've had long enough since parts of the Itera to forget about them). I never thought I'd consider giving up on Dale Head, but the thought did cross my mind. I actually couldn't ram food down my throat no matter how hard I tried. Therefore I couldn't run. I had a proper entourage to keep me company and keep me going - Todd, Nic, Helen, Cat, Lou, Zanthe and Keiren all patiently waiting for me to drag myself along. It was painfully slow, but eventually I got to the top of summit 42, Robinson, where I forced a pot of fruit down, using a compass as a spoon as there was no spoon on offer. The pictures of sunset look awesome but I wasn't really looking. Again at the road, there was a car and the thought of getting in was almost too tempting. But it was 5 miles to go so on with the road shoes. I adopted the 'keep on shuffling' tactic that had been such an integral part of keeping up with the rest of Team Haglofs Silva's walking speed last summer. Whilst my time was no longer going to start with a 20, I sure as hell wanted it to start with a 21. This kept me going down the road and at 21:53, amongst the hen do's of keswick, I reached moot hall :-). Possibly one of the slowest leg 5 times, but I had made it! A massive thank you to all my great friends who gave up their time to support me, all the hill support, Sally and Neil for road support, Dickie at honister and Em, Kris and Hananh - without the vintage shot blocks who knows how long I'd have spent on that road! It was a great day out with friends on one of the best days of summer this year. 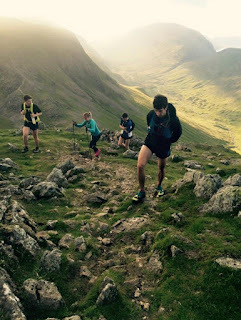 I was having an absolutely fantastic time to Wasdale and am very happy to have completed it first attempt. Racing through May - going long! It's been a while since I last wrote anything, May just raced by (quite literally) so here's a bit of a summary of the highlights! In April, me and Rosemary finished off the Open 5 series, somehow managing to take the win. This had definitely been the hardest series I've done, mainly due to being completely exhausted and my head having had enough of thinking during the week to want to race. To start putting that right, the following week I started a new contract as a part timer! Within a couple of weeks I was transformed back into my former self! Well - a lot closer at least. I had 4 weeks to prepare for the Old County Tops - something I'd entered in February through a brain fog with the idea that maybe something to aim for would help matters. As Sal had subsequently had a knee arthroscopy, I recruited a last minute change of partner in Steph Jones from Ambleside. I checked I could still run that far with a couple of big days out recceing the route and a quick trip to Scotland to recce Stuart Walkers silly birthday plans (something about running all peaks over 4000ft and riding between them)....Clearly running far was not my problem, my stamina had gone nowhere! The Old County tops has been on my to do list for a few year. 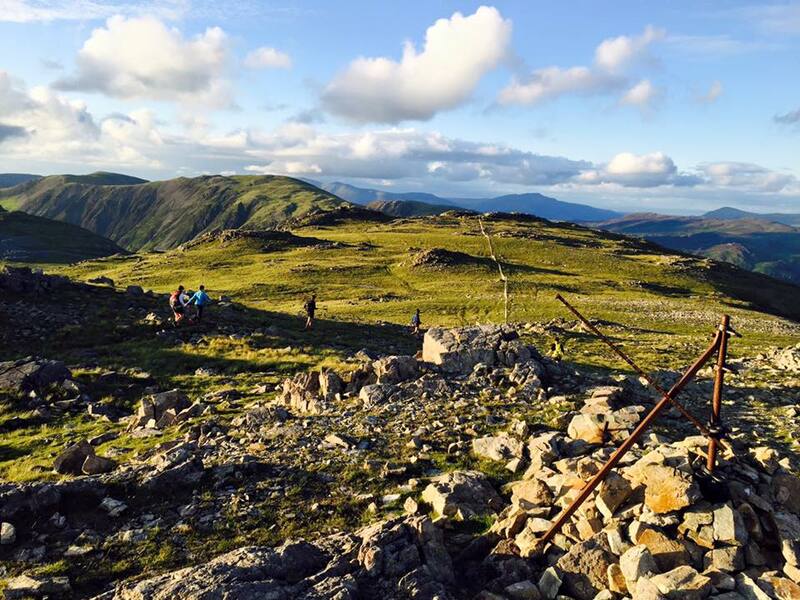 36 Miles from Langdale taking in Helvellyn, Scafell Pike and The Old Man of Coniston. The weather was on our side, a lovely day out. We took it steady to Helvellyn, summiting in 2hrs 3mins (planned not to get there in under 2hrs) and were following Sabs and Tom up Flowery Ghyll, steadily catching teams as we went. 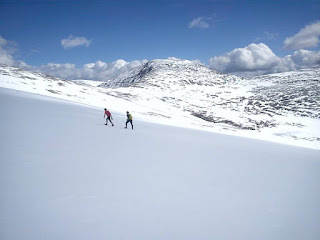 Across to angle tarn we hit some faster running and this is where my weakness showed. Steph was ace, keeping me running on anything it was remotely possible to run. Onto the rocks of Scafell Pike and it was my turn to take the lead. Soon we were up and over and down to Cockley Beck. The feed stations were excellent, banana in hand we headed up the final massive climb up the Old Man. On the ridge, the wind that had been noticeable on the tops all day, was more than noticeable. It was a strong, cold headwind (or so it appeared) out to the Old Man and I was struggling to keep moving. On this out and back section we got some incentive though, seeing Nicky and Jean, the leading female pair not as far ahead as we'd imagined and finding Rich and Wil (our other halves) only ~5mins ahead. 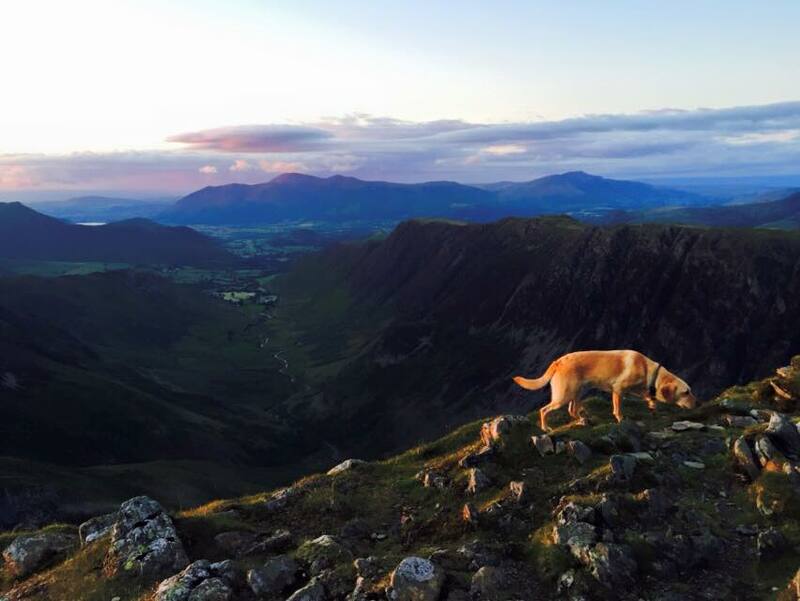 Recce - where is Helvellyn? On the turn we found the wind was still there, clearly being whipped in every direction. I was definitley struggling at this point, failing to lift my legs properly and tripping over rocks it felt like I was hitting the wall. But I'd eaten and drunk well and out of the wind had been fine. Then came the wheezing inability to breathe....aha - this might explain it. I got my buff out and adopted a ninja look and suddenly we were back running down to 3 shires stone. Hitting the road Steph announced she was 'feeling good' so it was up to her to drive the pace home (read: 'make me run'). We finished in 8hrs 56mins, skirting under the 9hr mark, within half an hour of Nicky and Jean and 5mins of Wil and Rich. The run of the day goes to Caitlin Rice though, 7hrs 44 to win the mixed pairs! This was an ace day out and Steph was a fantastic partner - I'll be back for more next year I think! 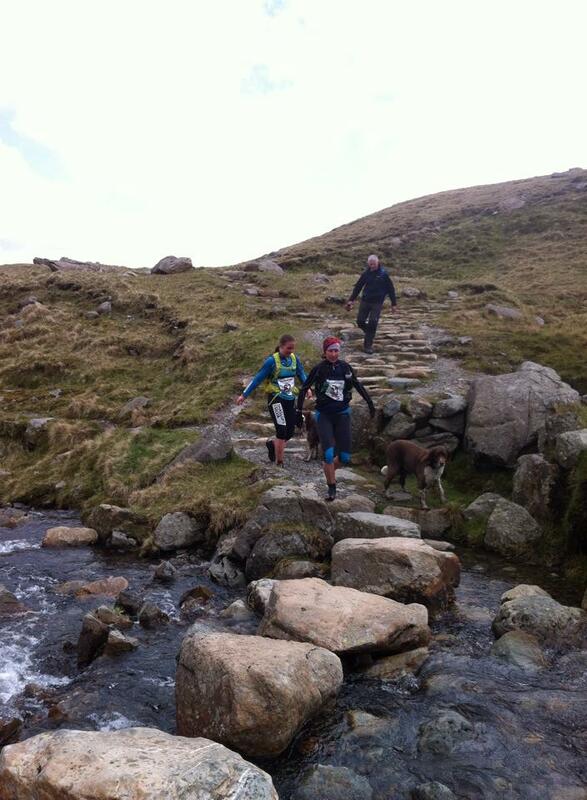 Next up was Duddon, one of my favourite races from last year - 18miles with 1800m of ascent. I'd run it during a period when everything seemed to come together, I had no breathing difficulty and waltzed round comfortably in 3:37, prompting my friend Chris to congratulate me with the line 'I didn't know you were that fast'. It's hard to enter a race knowing that you are going to be nowhere near your PB, especially an English Champs race. So I had to give myself a completely different target, trying to keep a '3' at the start of my time, ideally within a minute a mile of last years pace! This plan was going well to 3 shires stone, a little over half way in time. I had run well up the hills - well, the parts of hills that required a fell walk anyway - and was ~10mins down on last year at this point. Up swirl howe and suddenly I was dropping places. We were heading higher and again, the wind had got up. Running straight into the wind over to Dow, I found myself tripping over rocks and feeling really uncoordinated. After the OCT this rung a bell, so out with the buff and hey presto! Life got easier. I wasn't tripping over things! But you can only run so fast with a buff covering your face, so backwards I went, out of the Helm Ladies team who were packing well behind me all the way round! I had to stop a couple of times to get my breathing sorted and by the time I was dropping off Caw (which incidentally didn't feel as far away or as big as it did in my dehydrated state of last year), I knew it was going to be tight for sub 4. I'd given up racing at this point, so came in in 4:01 - enough for 23rd, which isn't a disaster at an Eng champs race, but could so easily have been a lot better! Somebody said 'you were going well into the finish' and I had to point out this is not a good thing as that means I had far too much left in my legs. 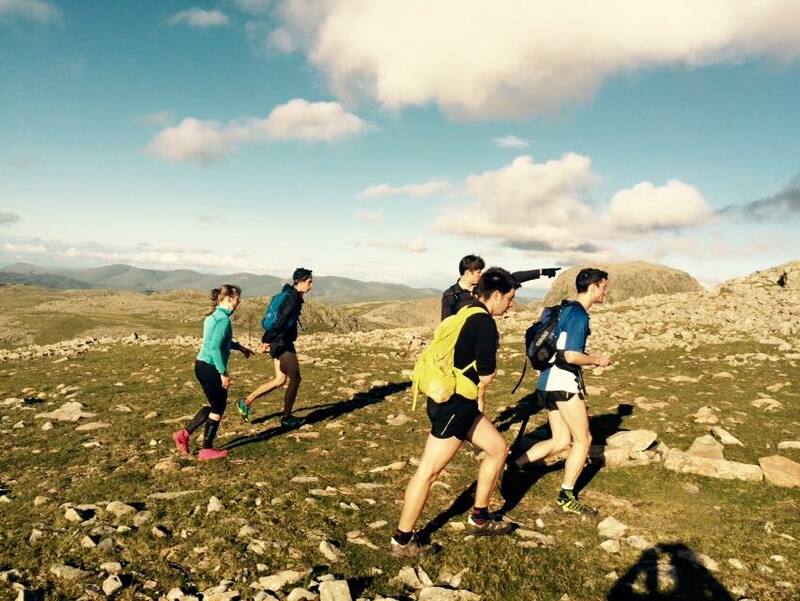 I enjoyed Duddon, but I have to say I'm enjoying just running a lot more than racing at the moment. 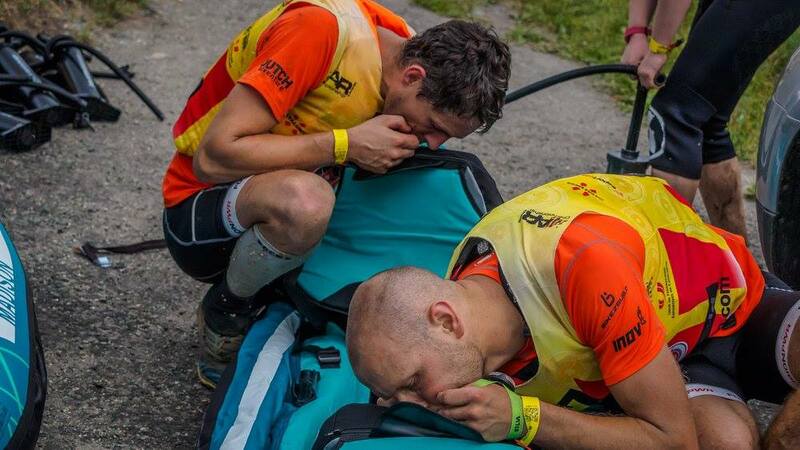 Racing when you can't push yourself without having your breathing going haywire just isn't fun as there are only 2 options, stop breathing or take it easy. However, the good news (I think) is that, after 2.5years of trying everything the NHS can throw at me, I've finally ended up under the care of a specialist team in Preston who don't respond to me with 'your asthmatic, you shouldn't expect to be able to run up hills all the time - here have some stronger steroids', 'well stop running then' or 'what do you expect'. On Monday they filmed my vocal cords as I breathed and saw that as I breathe in they obstruct my airways instead of moving out of the way as they should. 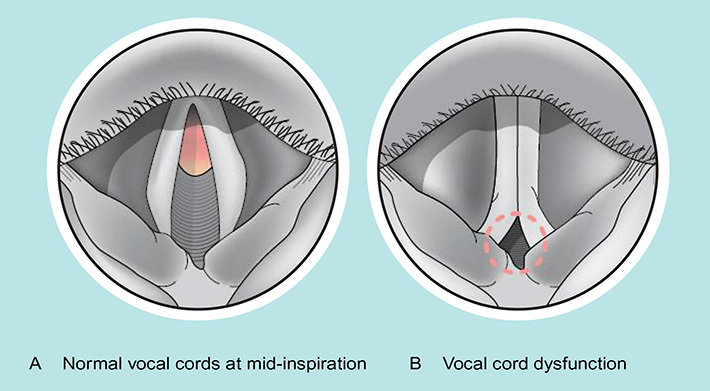 This is indicative of Vocal Cord Dysfunction and to difinitively prove how much this happens I am now awaiting more physiological/cardio/respiratory testing and filming of my vocal cords whilst riding an exercise bike. That appointment can't come soon enough! I'm a clinical researcher, however you'd be forgiven for thinking I have a career as a project manager, logistics coordinator, regulatory affairs assistant, specialist equipment trainer, writer, editor, designer, 24hour helpline, customer service advisor, commissioning engineer or quality assurance officer. 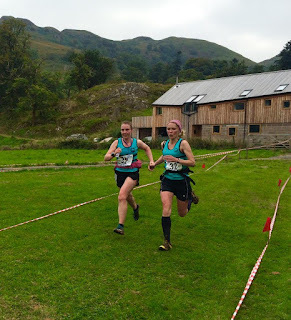 So I'm sure Rosemary was really looking forward to racing the open 5 with me last Sunday, after my description of training prep (or lack of it) and general mental approach to anything involving effort. I think my words were 'damage control' as opposed to 'full on racing'. As a measure to ensure I turned up on Sunday I instigated 'skiving Wednesday' (taking back the overtime accrued from Monday and Tuesday so as to stay sane), heading out for my first faster run in months with Sabs. 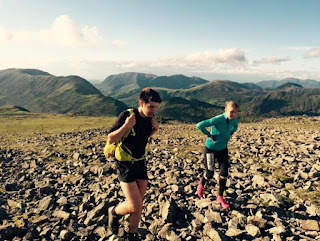 We ran from Ambleside, taking the coffin route to Rydal which is good and runnable. I have to say I was feeling the pace, Sabs is like a rocket on the flatter trails! Thank god for Loughrigg on the way back :-). It may have kept me sane but after the hour of running I spent the next two days exhausted (this is why I have been avoiding weekday exercise recently). The weather promised for Sunday was....well....less than appealing. What was initially promised to be 'heavy persistent rain all day with strong winds' turned into 'heavy rain with intermittent sleet/snow and strong winds'. I told myself me and Rosemary excel in these conditions, but was crossing everything that the met office had it wrong. Fine weather for the bike - great views! As it turns out, they sort of did have it wrong. It was a chilly start on Sunday, the wind was certainly there, but I could see patches of blue sky above Stainforth as we arrived! 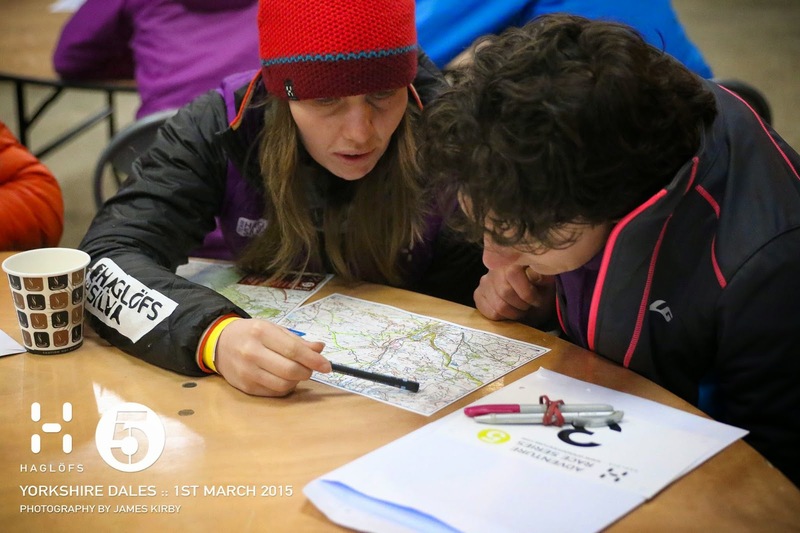 The usual pre race plotting got under way and after initially having loads of time, we did our classic, starting bang on 10:30am. The tactics were quite simple, keep it steady so I wouldn't blow up but keep the pace consistent and see where it got us. We chose to bike first in case the weather arrived later, as it's easier to warm up running than on a bike. I also opted to wear full waterproofs as I didn't want to risk getting cold. Being exhausted to start with I didn't want to waste energy on staying warm. Up the first hill I was pleased to be keeping on Rosemary's wheel (an improvement on December) and we were moving well on the flat/downhill. The route was well paved and we'd soon made it to the fun descent (the direction we were going anyway) down to Helwith Bridge. Here we saw a lot of people heading in the other direction, must be around the midway point! 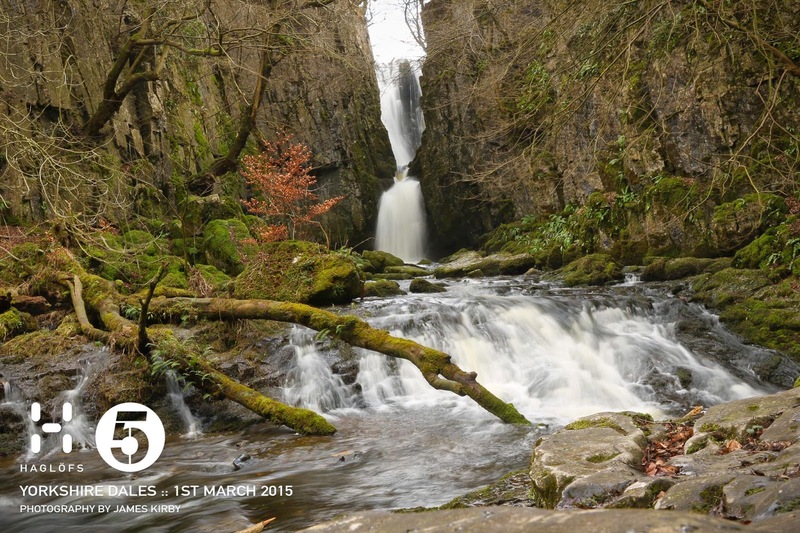 In Wharfe we decided to play it safe and headed straight for Austwick, missing number 2 as it wasn't worth too much. Then it was on across to Giggleswick scar for a bit more fun descending before hitting the road to transition. Coming into Giggleswick I noticed my bike was feeling a bit like a full suss but without the cornering control. Looking down I didn't have a lot of air left in my rear tyre. We pumped in some air and then hit it hard back to transition. I scraped in (thankfully not quite on my rim) and we got away with it! With the exception of the first hill, I'd chosen well on clothing, my Haglofs scramble jacket (now having had 2.5yrs of battering) and the super light L.I.M proof trousers keept the hail showers off and I was comfortable all the way. Whilst I got away with the bike, the run really highlighted my weaknesses. I didn't have an uphill run in me (was struggling to raise my heart rate), so it was a fast walk up the pennine way to the stunning waterfalls on Stainforth beck. Rosemary has also been practicing, so it was her turn to set the bruning pace over to jubilee cave, which I could just about deal with as it was flat/down. Here the weather arrived, SNOW! Very glad to be on two feet rather than two wheels at this point.We flew down the hill to the quarries near Langcliffe. 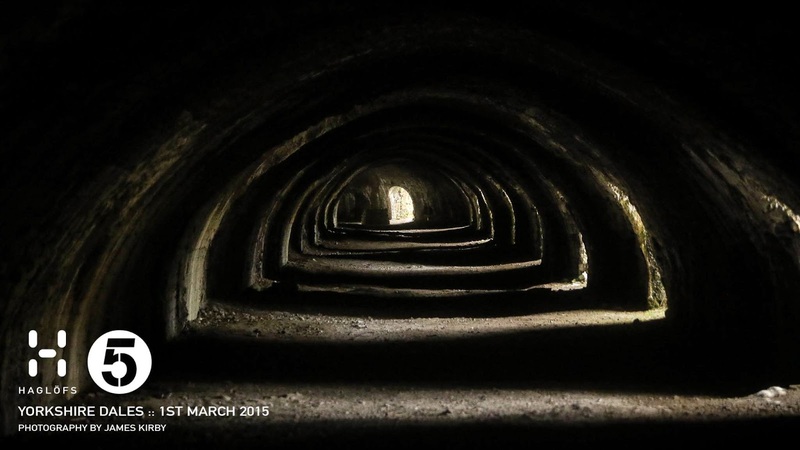 I couldn't fault the control locations on this run, the kiln in the quarries was huge! Getting a taste of my own medicine, we quickly switched the run tow from my bag to Rosemary's bag heading up out of Stackhouse. Here we collected three controls on the West of transition before arriving back in....wait for it....4hrs 52mins!! A whole 8minutes early, unheard of! Whilst we'd kept moving, we hadn't been as swift as we have in the past (and we'd been early), so we waited with baited breath to see where we finished. It was a beatable score, even we could have beaten it if we'd known I wouldn't blow up back at number 2 on the bike. After November's disaster we could do with a win. Clearly steady away payed off and our 510 points was enough on the day! Thanks Rosemary for a very enjoyable day out. Very happy with the result given I really didn't know if I could get around 5hours of racing at the moment. Two more days of work, then its off to sunny Majorca for a rest (and probably some cycling ;-)).